Irma Hernandez Schreiner is the new manager of the Friends Nature Store. Irma is a board member and has been a regular volunteer in the store. She will bring fresh ideas and energy to the store operations. You can see more about Irma on our "Meet the Board" page. Joe Saenz returns to Aransas National Wildlife Refuge! Joe Saenz, former Deputy Project Leader at Aransas NWR has returned as Project Leader. Joe has been with the US Fish & Wildlife Service for nearly 24 years, working in Minnesota & Utah before coming to Aransas. Since leaving Aransas in 2009, he has worked at Bitter Lake NWR in New Mexico, and most recently was Project Leader of the North Louisiana Refuge Complex. Joe is a native Texan, and says he is glad to come home to Texas and Aransas. Welcome to Daniel Jackson, who will be working at Aransas National Wildlife through the Pathways Internship Program. Dan is from eastern Oklahoma, and is a student at Texas A&M Galveston, studying Ocean & Coastal Resources. His first job through the program was for the U.S. Army Corps of Engineers. He will be at the Refuge until late August. Hilcorp Energy Company has joined Friends of Aransas at the Corporate Membership level. We truly appreciate their interest and support. You can see more about Hilcorp here. San Antonio Bay Foundation gives $31,000! The San Antonio Bay Foundation (SABF) has awarded $31,000.00 to the Friends Water for Wildlife Fund! The funds will be used to help ensure that whooping cranes and other wildlife have fresh drinking water on Matagorda Island. Funds were made available to the San Antonio Bay Foundation pursuant to a settlement agreement with the Texas General Land Office and Kirby Inland Marine. These funds are Supplemental Environmental Project funds which resulted from the oil spill in the Houston ship channel on March 23, 2014 and made landfall on Matagorda Island. Although we've had more rain than usual this winter and spring, it is crucial to provide reliable fresh water sources when drier conditions return. The San Antonio Bay Foundation recognizes this need. They have now provided funding for Water for Wildlife totaling $41,000.00. We are extremely grateful for their contribution and support. Shown below: Dan Alonso, San Antonio Bay Foundation Executive Director; Gene Corville, San Antonio Bay Foundation Board of Directors; Fred Lanoue, President, Friends of Aransas; and Bret Beasley, Biologist, Aransas National Wildlife Refuge. Unused Rookery Reward Fund donated to Friends! In the spring of 2013, a reward fund was established to be paid out upon arrest & conviction of the person(s) responsible for vandalism to a rookery island in San Antonio Bay. The fund was never used, and has now been donated to our Whooping Crane Fund. This fund is used for projects that directly benefit the cranes. Thank you to Penny Hong, Sally Mitchell, Patrick Rios, Kevin Sims and Tommy Moore for helping us help the Whooping Cranes! Veterans hunt hogs at Aransas NWR! 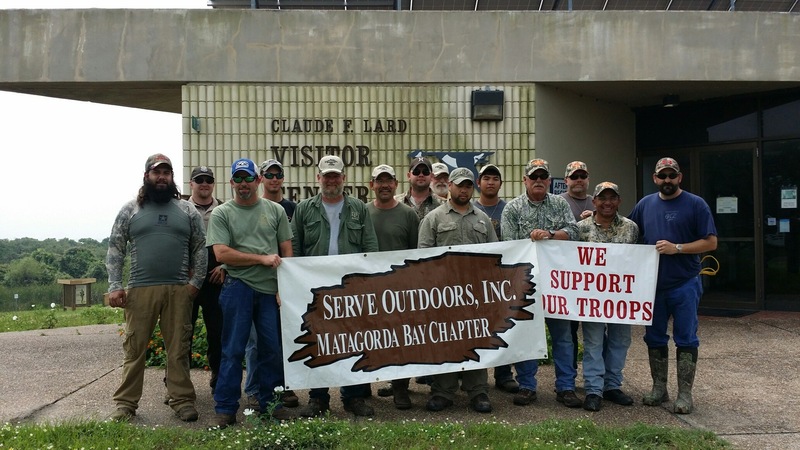 Aransas National Wildlife Refuge and Matagorda Bay Chapter of Serve Outdoors co-sponsored the Drew McGinnes Memorial Hunt April 24-26. Friends of Aransas supplied breakfast Saturday & Sunday, with Refuge staff helping to cook Saturday. We were also able to contribute two $50 Academy gift cards for a "thank you" drawing. Giving these veterans with disabilities a recreational opportunity and getting rid of some hogs at the same time is win-win!! We were honored to be a part of it. 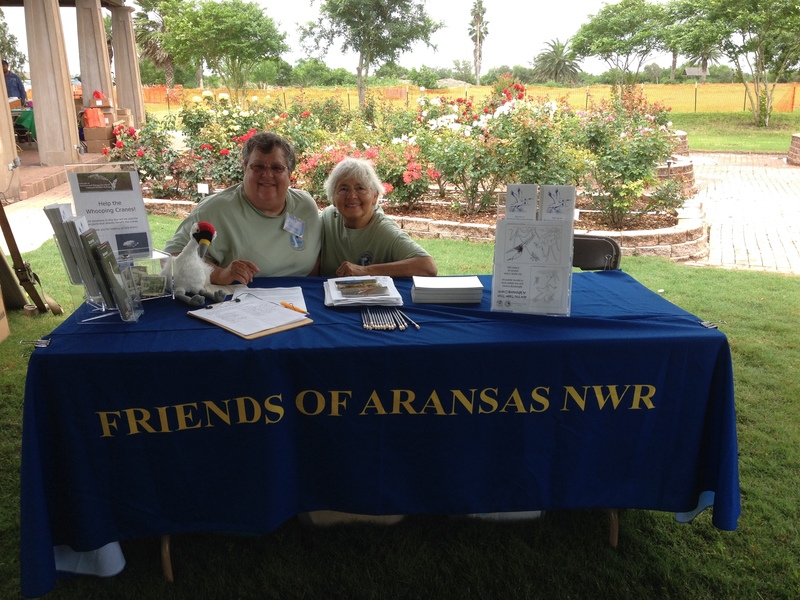 Friends of Aransas Board Members Linda Swiggett & Irma Schreiner represented our group and Aransas National Wildlife Refuge at the World of Water in Corpus Christi April 25th. Staff and volunteers have been busy with several projects the last few months, and have gotten a lot done, in spite of the cold & rainy weather. 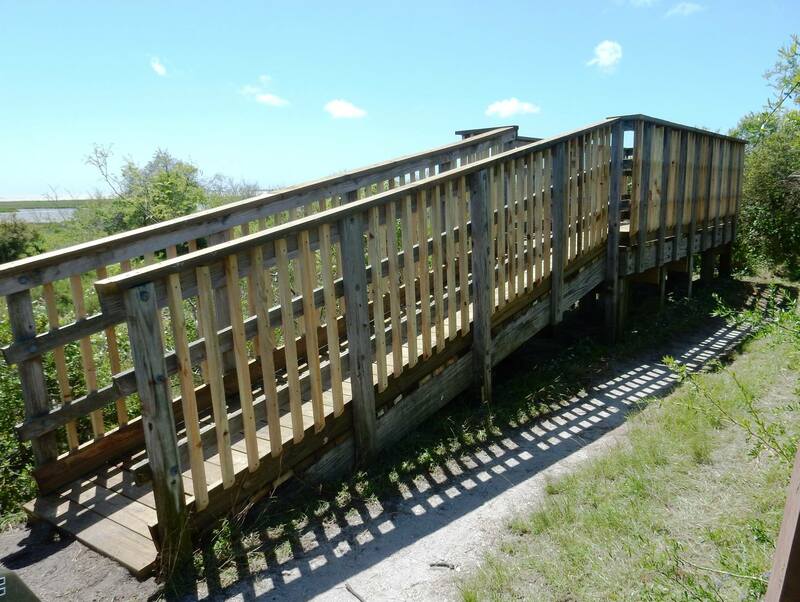 Earlier we posted about the new tower boardwalk, & new platform at the end of Big Tree Trail. Now we have two more completed projects. There is a wonderful new platform at the Alligator Viewing Area. This one is great because it's raised, so that you look down on Thomas Slough & the area the alligators like to lie in. You can get really nice views, while remaining perfectly safe. You can also see among the cattails, to better search for birds. It's wheelchair accessible, too.! The other platform is on Heron Flats Trail, after the trail curves back towards the woods. This viewing platform had to be closed, and was greatly missed by many. It offers a view of the "far end" of Heron Flats that can't be had anywhere else. The platform has now been rebuilt and conforms to current codes. Most of our seasonal residential volunteers have left now, and the others will be leaving soon. They have made a tremendous difference, though, and their work will be enjoyed by refuge visitors for many seasons to come! Rockport donates to Water for Wildlife! 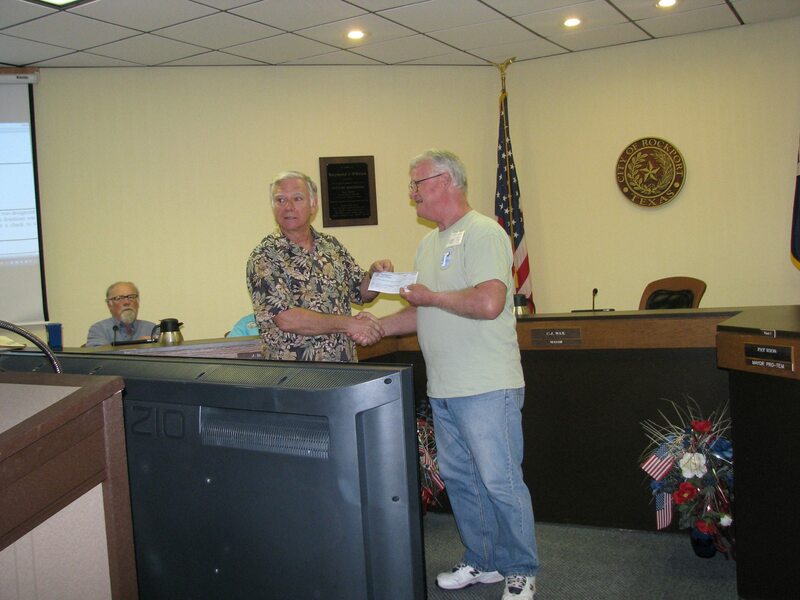 At the last Rockport City Council meeting, Mayor C. J. Wax presented Friends President Fred Lanoue with a check for $735.00. This year we partnered with the city in their annual Whooping Crane Strut. A portion of each entry fee was designated for Water for Wildlife. Although we've had good rains the past few months, dry tomes will definitely come again. The check has been deposited in our Water for Wildlife Fund, to help the refuge supply reliable fresh water sources for Whooping Cranes and other wildlife. Thank you to the City of Rockport, Tom Staley & the Parks Department, and everyone that participated.